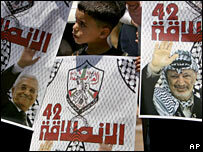 The Al-Aqsa Martyrs are loosely affiliated to Abbas's Fatah party. Israeli troops have shot dead a Palestinian militant at a refugee camp in the West Bank town of Jenin. The man was a member of a militant group linked to the Fatah movement of Palestinian leader Mahmoud Abbas. The Israeli military say their troops returned fire after coming under attack at the camp. Israel Radio said the man was a local commander of a Fatah militia and had been wanted by the army for alleged attacks on Israelis. An Israeli military spokeswoman confirmed the man was shot dead during an overnight raid in the Jenin refugee camp. "He had an M-16 (assault rifle) with a telescopic sight," she said. "During the incident, an explosive charge was thrown and the Israeli force came under fire." The militant al-Aqsa Martyrs' Brigade said the 25-year-old gunman was one of its Jenin commanders, and that another group member was wounded in the fighting. The dead man was considered close to Zakariya Zubeidi, a high-profile leader of al-Aqsa in the Jenin camp who is on the Israeli army's wanted list. Israel has said it will continue operations against Fatah gunmen in the West Bank. Salam Fayyad, prime minister of President Mahmoud Abbas's emergency Palestinian government, has said Israeli raids in the West Bank undermine Fatah's intention to disarm gunmen in the occupied territory.